14 telecom operators participate in the Surfmobile campaign initiated by Vice-premier and Minister of the Digital Agenda and Telecom, Alexander De Croo, BIPT (Belgian Institute for Postal Services and Telecommunications) and the FPS Economy to promote mobile Internet in Belgium. As of 1 October they provide advantageous actions such as supplementary data volume, for persons who up until now did not use mobile Internet, or only to a small extent. You can find a list of the participating operators on www.surfmobile.be/initiative. 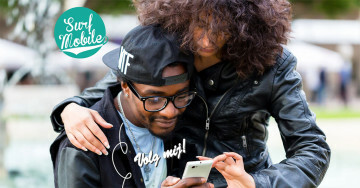 Late June the Minister, together with BIPT and the FPS Economy, launched the website www.surfmobile.be in order to instil trust into the consumers and to inform them of the advantages of mobile Internet and of the good, safe and controlled use thereof. The website also includes a clever simulator allowing users to estimate the data volume they need. This way consumers can determine more easily which telecom subscription suits them best. As announced the second phase of the campaign promoting mobile Internet kicks off on 1 October. 14 telecom operators signed up for the campaign. As of 1 October they provide various advantageous actions, such as extra data volume, for people who did not, or only to a small extent, use mobile Internet up until now and will inform consumers of the easy and safe use thereof. This campaign is an opportunity for people to become acquainted with the advantages of mobile Internet. The purpose is that people can have a taste of mobile Internet in an accessible and informal manner. You can find a list of the participating operators on www.surfmobile.be/initiative . With this initiative, the Minister, together with BIPT and the FPS Economy, want to give mobile Internet in Belgium a boost. A boost that is needed. The penetration rate of mobile Internet may have increased strongly in our country these past few years: from 16% (2011) to 57.5% by the end of 2014, but despite catching up Belgium is still below the EU average (66.7 %).